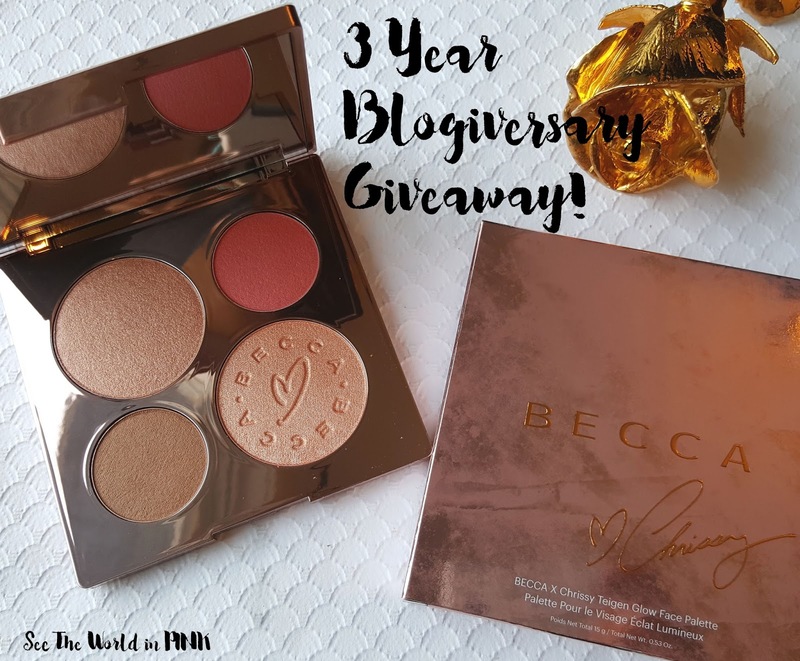 Happy 3 Year Blogiversary!!! Celebrating With A Giveaway!!! Today marks the 3rd Blogiversary of See The World in PINK!!! It's really hard to believe that I have been doing this for 3 years now! It's so weird to look back at my old posts - this blog has really grown and changed over the past 3 years! But, I'm so proud of where it has come and I feel like the past year has been especially great for See The World in PINK! I'm finding my voice, putting out content I am proud of and ever evolving and improving! I like to use this opportunity to say thank you to all my readers/followers and host a little giveaway! So, thank you for sticking with me through all my growth and changes - or if you are new to See The World in PINK, welcome and I hope you enjoy the blog! I just picked up this brand new, limited edition BECCA X Chrissy Teigen Glow Face Palette - this is a stunning palette that was just released!!! The Becca X Chrissy Teigen Glow Face Palette is described as "achieve the ultimate endless summer glow with the BECCA X Chrissy Teigen Glow Face Palette. Chrissy Teigen captures the essence of what BECCA stands for: effortless, natural, authentic beauty. Together, they’ve collaborated for a gorgeous face palette full of warm, lush, sultry shades of highlighter, blush, and bronzer—all hand-picked by Chrissy herself." Good luck everyone! And thank you for visiting See The World in PINK!!! Oh man, I SO wanna win this! Chrissy Teigen is my spirit animal, and those colours are stunning! haha - she is so awesome! Thanks Christina! It's almost hard to look back to 3 years ago at my old posts, but it is worth it to see the huge improvement! happy anniversary! my favourite thing is your Friday Five! I love to hear about what you love! ooooh - I love writing the Five on Fridays so I'm glad you like them! Happy blog birthday! I have really enjoyed your product reviews and photography skills...really helps me decide on whether or not to buy the new hot beauty products or not! it is such a nice palette! Happy Anniversary! I Love read your Favorites of the month. I always look forward to my favorites! Thank you - glad you like both of those! Happy Blogiversary! I love reading and seeing reviews and swatches. Thanks Sandra - my favorite things to blog about! Happy 3 years! You're gorgeous and your blog is perfect! Thanks Sarah - you know I'm a huge fan of your blog as well! Happy anniversary! I am enjoying your honest opinions and suggestions for skincare and beauty products. I appreciate natural products that are effective and not tested on animals. Plus I love that you are posting book reviews. I am an avid reader too! I am interested in whether charcoal is really effective for teeth whitening as well as hair & body benefits. Thanks Dana!!! Will keep that all in mind! This is so generous! Happy blogiversary! I love your blog. I read all your posts! Thank you!!! I appreciate that! Happy Blogiversary! Love your blog and especially the reviews on K-beauty products. Thanks! I love k-beauty so there will always be lots! Happy 3 years Renee! I love your nail and Kbeauty posts! I love you face mask posts as well because it's one those things that we all have (I have 100 right now that I really should use...) and I never get to review. Thanks Jayne!!! I love masks and k-beauty so I always have a ton on hand to review!!! I found you when I was checking out subscription box blogs and still visit your site often. I love your reviews, and that you are from Alberta and I know I can find the products you love (and avoid the ones you don't). I would like to see gift guides and make up application tips. I think your blog does a great job of showing what items are worth splurging on and items where basic brands are good. Both great suggestions - thanks Brenda! Happy Blogiversary! Woo 3 years! I agree with the love of K-beauty posts. Happy Happy Blogiversary. Thanks for all of your reviews. I truly value them and you. You are amazing! Happy Blogiversary! I really enjoy your reviews. I'd love to see more tips and tricks. Congratulations! I enjoy reading your posts and appreciate the honest product reviews! More of those are great! Good luck everyone that has entered ! thanks! oooh brush posts would be good! This is amazing! Congrats. I just started blogging and will be starting a youtube soon. I'm super happy to have found this place! 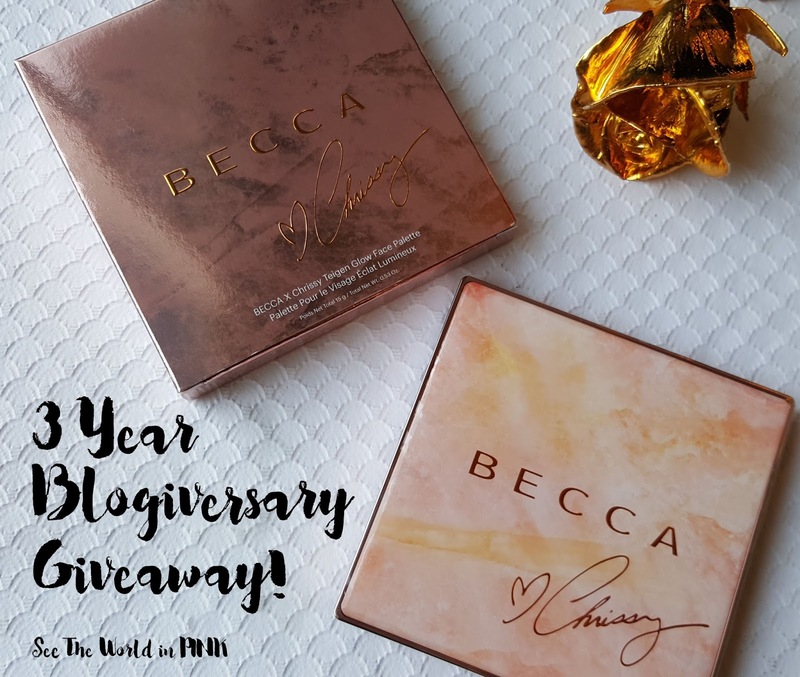 Happy blogiversary ! More makeup reviews, please ! Thanks for the chance ! Happy 3 year! The name of the blog is fantastic. I love pink. I just wore a vintage rose pink gown to renew my 25th. Wedding vows. Your site is easy to navigate and the manicures are my fav. Maybe some suncare prodcuts and anti-aging would be great...Keep up the good work. Happy Blogiversary! I really enjoy your empties !!! Such a beautiful palette... I love your reviews! i like to see mac reviews. Good to know, I will get some Mac to review on here! I enjoy reading reviews and seeing nail polish comparisons. I really enjoy your product reviews they really help me decide on whether or not to buy. I love your blog and consider you my favourite beauty blogger. Love your instagram posts too! Thanks Courtney - I really appreciate it!!! Thanks! Glad you like the subscriptions boxes, that's how this blog started! OMG!! my favorite thing is your Friday five! i love to hear about all of the things you love. Thanks - I love doing my Five on Friday posts! More giveaways and reviews are always good! Thanks so much Jenny - I appreciate it! Happy blogiversary! That palette is amazing! Thank you - yes it's a beautiful palette! Happy Anniversary...I just stumbled across your blog and it looks great!!! Thanks for this amazing giveaway!!! i'm a beginner when it comes to applying makeup so i like tutorials and vidoes. Happy Blogiversary! Thanks for the giveaway this palette looks stunning. I love to see nail posts. Great! I love doing nail posts!